New England Bites: New England Bites - Double Feature! New England Bites - Double Feature! 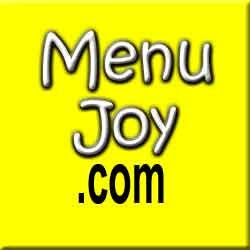 Eat all you want or diet? These are the questions we here at New England Bites hope to answer for you in the New Year . Which brings us to this week's Bite of the Week ... or should we say Bites of the Week. 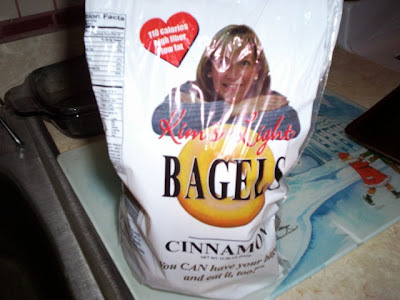 BITE ONE: Since it's almost EVERYONE'S resolution to lose weight in the New Year , we decided to try a HEALTHY breakfast item we had heard about ........KIM'S LIGHT BAGELS ! We found a six-pack in the bread aisle at Stop & Shop . They come in different varieties such as ...plain , wheat , onion , cinnamon , blueberry and everything . Each one has 110 cal . ( quite a come-down from the 400 cal. ones from the coffee shops ) , 1 gr. of fat and 4 gr. of fiber . Of course they're a bit smaller than the car tires we're used to eating ....but they're not tiny . VERDICT ......pretty good ! We bought the cinnamon ....and although I didn't find a dynamic cinnamon flavor .....they had a decent taste and a fantastic cinnamon smell . I would definitely get them as part of a healthy eating plan. BITE TWO: In the bakery section of Auclair's Market , there are many pastries imported in from Maine .....cookies , muffins and ..........WHOOPIE PIES !!!!! It seems that Maine is the WHOOPIE PIE CAPITAL of the country . There are several different companies specializing in these tasty cream - filled cakes . 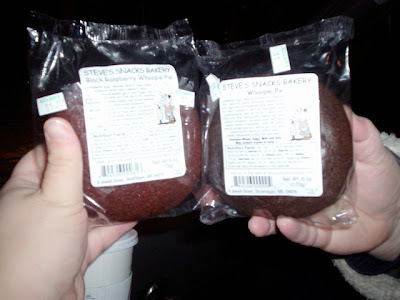 So , Laura & I decided to purchase 2 - whoopies ( we could have shared 1 ....they were so BIG .....but NO ) from STEVE'S SNACKS of Maine . Laura got the black-raspberry and I got the original ....and BOTH were as big as a piece of birthday cake . So much for healthy eating ......sorry New Year's resolution . As expected ....they were delicious !!!!! Probably the BEST whoopie I've had . The cake was nice and moist and the filling not overly sweet . I'd love to have another except I feel guilty when I read the back of the wrapper . This will have to be a once-in-a-great-while-when-my-blood-sugar-is-low treat . I look forward to it .